Alessandra is the priestess of Arkay in Riften. She tends the Hall of the Dead, located beneath the Temple of Mara, by herself. When you speak with her, you will note a certain bitterness about her position: "I didn't ask for this job, I got stuck with it thanks to my father." Her father was a Priest of Arkay and it was his desire that she follow his footsteps. As a result, her entire life has been spent around the dead, learning the proper burial rituals and prayers. While she seems to have accepted her lot in life, albeit reluctantly, she feels the need to make peace with her father. Unfortunately, her father did not live to see his daughter become a priest. Alessandra holds her father's ceremonial dagger as well as the one she received when she did complete the training. She asks you to journey to the Hall of the Dead in Whiterun to place her ceremonial dagger with her father's remains, fulfilling her honor-bound obligation to him and making peace with his memory. 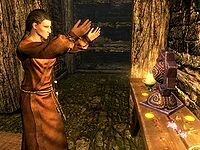 The dagger needs to be delivered to Andurs, the caretaker at the Whiterun Hall of the Dead, who will inter it with her father's remains. If you agree to help her deliver the dagger, she'll appreciate your help and entrust you with it. Esta página foi modificada pela última vez à(s) 10h44min de 11 de julho de 2015.